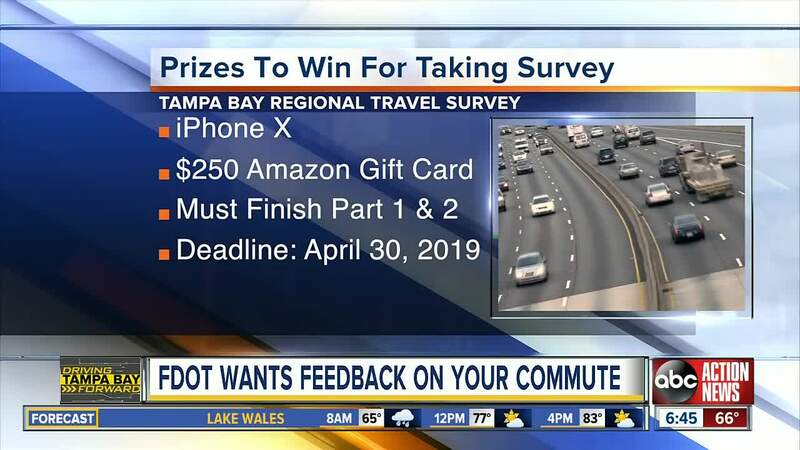 The Florida Department of Transportation wants to know how Tampa Bay area families get to work or school. They say if you take their survey they will enter you into a drawing to win prizes. You will also receive a $10 Visa gift card for completing the survey. Use password TBRVTV to take the survey. FDOT wants to know when, how and why you travel to help regional transportation planners make decisions that ultimately will impact your commute. Those who complete both part one and part two of the survey will be eligible for prizes like an iPhone X or one of five Amazon gift cards, each worth $250. You must complete both parts of the survey by April 30, 2019 to be entered in the prize drawing. By participating, you will help ensure people like you are represented in transportation planning decisions over the coming years, FDOT said. The first part of the survey asks questions about your household, such as how many people are in your family, how they get to work or school and if they use ride sharing apps like Uber or Lyft. They also ask if you ever ride a bike or take public transportation. The second part of the survey either involves filling out a travel diary online or installing an app on your phone for five days to track your travel, called RMOVE . By installing the rMove app on your phone (available for Apple and Android), trips you take over a 5 day travel period will be automatically recorded and you will only need to answer a few short questions for each trip and for each day of the travel period, according to FDOT. Your identity will be protected, and all answers will be kept confidential. Your responses will be combined with those of other residents to understand regional travel patterns, FDOT said.